Midwest Moma Blog: Summer School....and why my kids go! Every single year my kids fight about whether or not they are going to go to summer school. It's the same story every year: "mom, I don't need, I know everything," "My friend so and so isn't going," and my all time favorite, "summer school is boring!" Yet every year, my kids go. Period, end of story, it is happening! Day One this year was yesterday and my kids came home with stories of friends, both old and new, awesome teachers and exciting plans for the rest of the month. 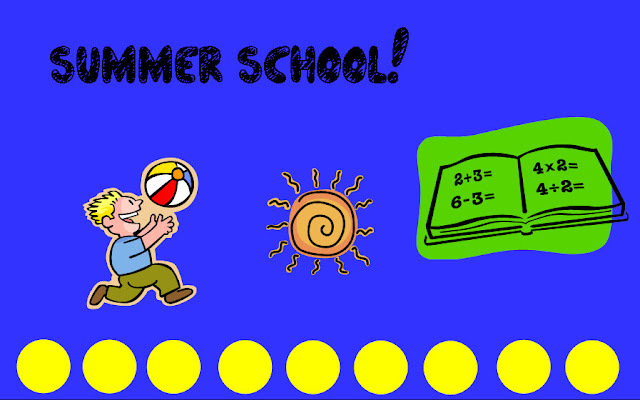 Summer school isn't boring, their friends do go and by golly YES, they need it! A couple of years back, I was pursuing my secondary education degree ((another story for another day about why I decided to stop)). I took a psychology of education course, probably my favorite course of all time for several reasons, but today I will tell about the one reason that you need to hear. In this class I was assigned a topic to research and write a 15 page paper on. That topic was about the arguments both for and against year round schooling. This topic was extremely intriguing because I live in a state that does not have any district that follows a year round calendar. We still adhere to the standard 9 month calendar with a two and half month summer vacation. There are good and bad points for both sides but if I had to choose one, if I was willing to pack up my whole family and their lives to reach the choice I wanted most for them....year round school would win every single time. It is my opinion that retention is the biggest goal that schools in this country can't seem to master. Teachers will spend the entire first quarter reviewing what was learned the year before....when a week or two should be all that is needed. For some subjects, students will spend the better part of the year re-learning what was taught the year before. My children do not need a two and half month vacation! They need to not forget their math! They need encouragement from more than just me to read during the summer. Also, our district adds curriculum they don't get during the school year. Extra science and social studies lessons that they wouldn't get otherwise. This has always been the driving motivation for them to go. The numbers and stats I saw during my research on year round schooling have kept me up at night. My kids aren't getting that! My kids need that!! They may hate me for the first week of June...but 20 years from now...they'll thank me...probably silently, to themselves, but still they will! A lot of parents have good reason not to send their kiddos to summer school; lack of busing, early hours, vacations, etc. All I have to say is this: Keep retention at the forefront of your summer vacation! Review math with flash cards, keep them reading, and every once and while pull out a hand full of scientific facts or social studies fun info for them to learn about. It's the best thing you can do when summer school is not an option for your family!